Intense negotiations are under way to form the UN peacekeeping force planned to back up the ceasefire between Israel and Hezbollah. The UN hopes to get 3,500 troops on the ground in southern Lebanon within two weeks, mostly from France. No countries have yet formally pledged troops, although several have said they will. UN officials say there is concern about the force's rules of engagement. The ceasefire, in its third day, is holding despite sporadic violence. French Foreign Minister Philippe Douste-Blazy is in Beirut and is expected to meet Lebanese Prime Minister Fouad Siniora to discuss conditions for the deployment of French troops. Foreign ministers from Turkey, Malaysia and Pakistan - other possible troop contributors - were also expected in Beirut. At the UN in New York, a French general and colonel are to meet UN officials for further talks. But BBC defence and security correspondent Rob Watson says that for now there is something of a chicken and egg problem at the UN. France is hesitant to make specific troop commitments until it knows what other countries are prepared to do - but those countries are waiting to hear what Paris will decide, he says. About 45 countries have attended UN meetings to discuss planned deployments. A spokesman for UN Secretary General Kofi Annan described the situation as "extremely precarious" and said the most urgent task was to get troops on the ground. Israeli Foreign Minister Tzipi Livni is also in New York - for talks with Mr Annan about how to implement the ceasefire resolution in full. 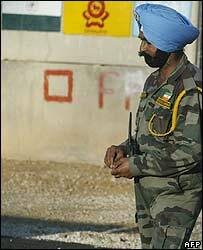 The UN aim is to boost the limited existing force, Unifil, as soon as possible, enabling it to take over positions as Israel withdraws and a 15,000-strong contingent of Lebanese troops moves in. The multinational force would then later be brought up to its full contingent, also of 15,000 soldiers, that was agreed in the UN ceasefire resolution passed on Friday. Lebanon says it will start moving its 15,000 soldiers towards the south this week, while Israel says it could pull out within 10 days. But Israel's army chief, Lt-Gen Dan Halutz told a parliamentary committee that Israeli forces would stay until the multinational force arrived, "even if it takes months", Israel radio reported. In southern Lebanon, aid agencies are trying to deliver badly needed food and medicine, while the UN has warned returnees of the danger from unexploded ordnance. Tens of thousands of Lebanese have continued to return to their homes in southern Lebanon, although the Israelis say the area remains unsafe until Lebanese and UN troops are deployed. The UN says around 250,000 people have already returned, and aid officials estimate that another 500,000 are on the move. But the BBC's Kim Ghattas in the southern town of Tyre says in some villages many homes have been destroyed and there is no electricity or running water. Some returnee families are heading back to Beirut after finding they have nothing to go back to, our correspondent reports. About 1,000 Lebanese - mostly civilians - and 159 Israelis, mainly soldiers, died in 34 days of fighting which began after the militant group Hezbollah seized two Israeli soldiers in a cross-border raid on 12 July.